Here is a brilliant concept by Swiss designer Nicolas Le Moigne. This clever water pourer turns most plastic bottles into an eco watering can, the Twist and Spout and it just won a special Merit Award at the Housewares Fair in Milan for its unique design and utility. What’s the catch? It’s quite simple, you place it on a bottle and Voila’ you have an ergonomic pourer. It fits virtually any soda or water bottle with a screw-on cap. 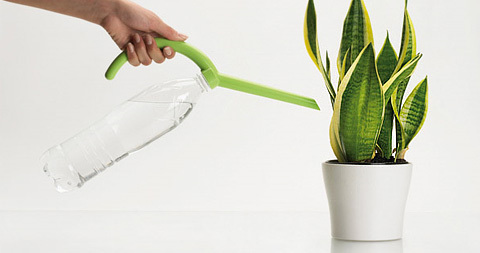 A clever eco water pourer turns any old bottle into a watering can.